2018 was the year you tied the knot (Mazel!). There are so many firsts for you and your significant other to celebrate. Your first dance, your first home, and this spring, the most exciting of all: your first tax filing. The top of your wedding cake may be chilling in the freezer, awaiting your one-year anniversary, but you can no longer put your taxes on ice. Fear not, lovebirds: Just because tax day draweth nearer doesn't mean the honeymoon is over. H&R Block is here to help and make sure that planning for your 2018 return is less stressful than planning for your big day. "If you haven't already, have an honest discussion about any outstanding debt with your spouse," Rigney says. In other words, it's good to keep surprising your partner -- but not when it comes to your finances. The IRS can take your refund to offset your or your spouse's outstanding debt (including tax debt, child support, alimony, even outstanding student loan debt). “Have that discussion before you file," Rigney suggests. 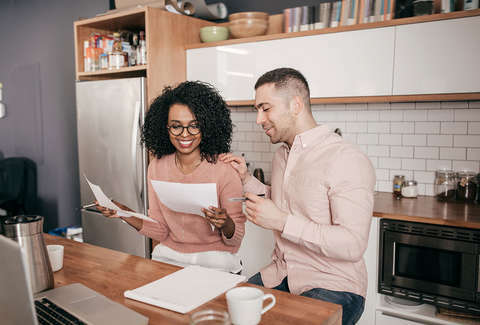 "You can still file a joint return to get the best tax outcome, but you'll need to file a special form to make sure the spouse without the debt doesn't lose his/her share of the refund. It's called an injured spouse form." "Whether you’ve been filing as single or head of household in the past,” Rigney says, “you'll have to learn new filing thresholds, new tax brackets, and new tax benefit thresholds now that you're filing as a married couple." Tax benefits that change based on your filing status include: the child tax credit, education credits, the student loan interest deduction, and the earned income tax credit. Keep in mind, it’s possible that you might not get some deductions and credits you've been getting in the past. But you may get a higher threshold for some tax benefits and qualify for some credits that you may have earlier been phased out of. Just like a good relationship, it’s all about give and take. Taking your spouse's name is always a personal, and oftentimes, aesthetic decision. Who are we to tell you how to live your life or who you should live it as? But if you do decide to switch up your moniker, inform the IRS. "If you changed your name when you got married, make sure you notify the social security administration of the name change so that the IRS doesn't have any issues processing your return,” Rigney says. What they say is true: marriage changes everything. And while there are new brackets, deductions, and withholdings to take into consideration, there’s no need to fear: H&R Block tax pros are available in person and online to walk you through this first year so the most stressful part about your new marital life won’t be doing your taxes. Remember, this is the first of many times you and your spouse will conquer tax day together. Set the tone from year one with open, honest, and -- most importantly -- informed communication to pave the way for 2018’s refund and future refunds that you two can put toward building an amazing life together.